Possibly Kept in Smithsonian Institution, Washington, DC, USA. This miniature is about a story in the Silsila al Dhahab (Chains of Gold), the first book of the Haft Awrang (Seven Thrones), by the poet Jami. 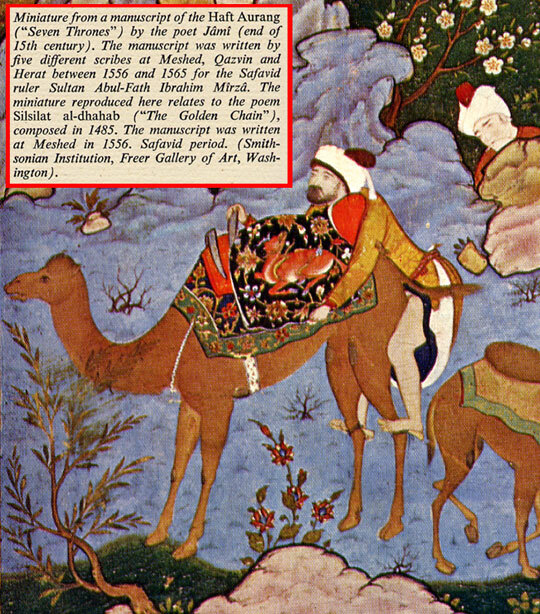 The manuscript was written by five different scribes at Mashad, Qazvin, and Herat between 1556-1565 for Safavid Ruler Sultan Abul-Fath Ibrahim Mirza. To read more, study Rūmī and The Hermeneutics of Eroticism By Mahdi Tourage.